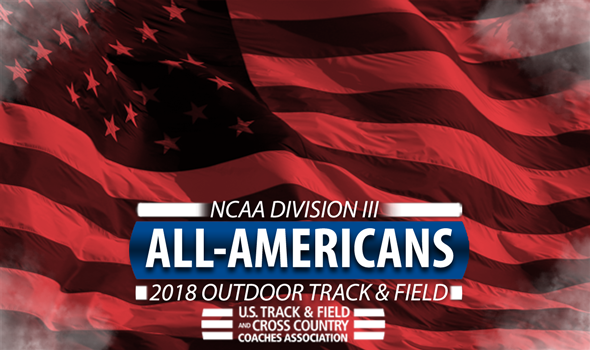 NEW ORLEANS – All-America honors for the 2018 NCAA Division III Outdoor Track & Field season were announced Tuesday by the U.S. Track & Field and Cross Country Coaches Association (USTFCCCA). Student-athletes earned USTFCCCA All-America status by virtue of finishing among the top eight of their events, including as a member of a relay team, at the 2018 NCAA Division III Outdoor Track & Field Championships this past weekend in La Crosse, Wisconsin. UMass Boston’s women had the most All-Americans of any program with 13. The Beacons, who shared the team title with George Fox, were paced by Wadeline Jonathas and Taylor Driggers. Jonathas nabbed five All-America honors (200, 400, 4×100 relay, 4×400 relay, long jump), while Driggers added four of her own (4×100 relay, 4×400 relay, long jump, triple jump). Speaking of the Bruins, their athletes earned 10 All-America honors. Sarah King led the way with three of her own from the 200, 400 and 4×100 relay. Three other women’s teams totaled double-digit All-Americans: Washington (Mo. ), Emory and Williams. The Bears took home 12, the second-most regardless of gender, while the Eagles (11) and Ephs (10) weren’t too far behind. North Central (Ill.)’s men led their gender with 10 honors. The Cardinals, who finished runner-up in the team standings, were led by Dhruvil Patel and Peyton Piron. Patel earned All-America honors in the 5000 and 10,000, while Piron added a pair of his own in the 400 and the 4×400 relay. National champion Mount Union took home nine All-America honors. A.J. Digby was the only multiple All-American for the Purple Raiders as he won the 400 and anchored their 4×400 relay team to a walk-off victory. Athletes from Augustana (Ill.) and Rowan both earned eight All-America awards. See below for a full list of NCAA Division III Outdoor Track & Field All-Americans.